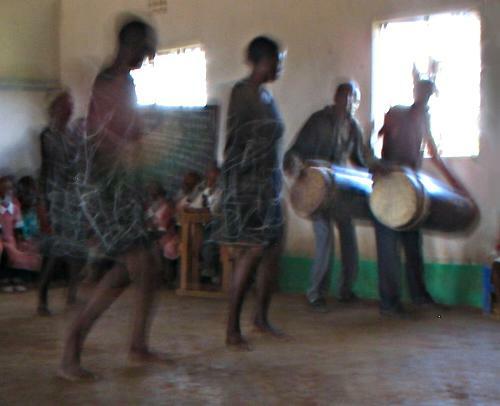 Here’s the best pic from the day of traditional local dancing I went to recently. Still photos just didn’t work because of the low light but I have some avi movies. They are large files and you have to turn the brightness up on them but they show clearly the crazy acrobatics these guys pull off. This entry was posted on Friday, March 4th, 2005 at 2:19 pm	and is filed under Uncategorised. You can follow any responses to this entry through the RSS 2.0 feed. You can leave a response, or trackback from your own site. What kind of style/tradition is this, do you know? read this before Monday night (7th March)…? OMG! They’re doing the tunble-dryer aerial! and CHARLESTONS!!!!!!!!!!!!!!!!!!! how cool is that 🙂 eeep! eeeppppp!! !